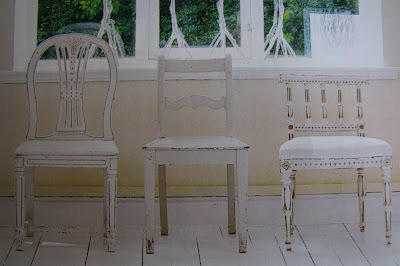 When I saw these lovely Swedish painted chairs in the latest Home Beautiful magazine (February) I was sold. Well, the magazine was, actually. The home featured (pages 84 to 93) belongs to an Orrefors glass designer in southern Sweden. I adore Swedish interiors, particularly the use of worn painted furniture such as the above mix of chairs to the Gustavian couch below. 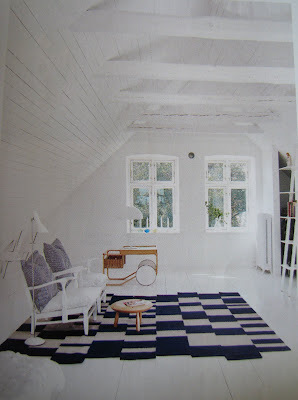 Most of this interior is white, with splashes of blue. The Gustavian couch is wonderful and is a highlight in the loungeroom. We will be on the hunt for one or two of these on our next buying trip (wish us luck!). The owner made the cushions herself including hand-printing the fabric. I am not sure if I love the carpet, but it is bold, I guess. 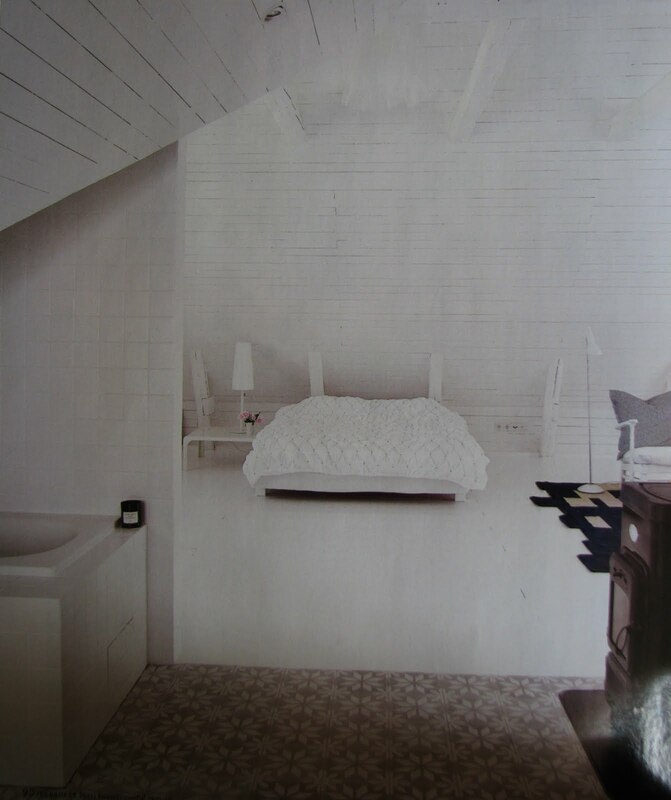 However I think an all-white interior like this is bold in itself. What a roomy bathroom! The floor is stencilled concrete. At first glance it appears to be tiles. The bedroom is also very roomy! It looks to be a calming place to rest the weary head each night. Overall, this home is light and airy and looks to be a delight to live in! What does everyone else think? 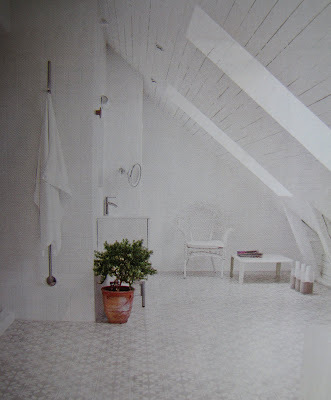 Ooh definitely liveable ;) I especially love the couch and the bathroom, especially the plant in the terracotta pot. this is a beautiful space. i love white interiors, it jus tlooks so bright and clean. i know this would never work in my own perosnal space though. im too messy! Hi! Just discovered your blog, thanks to Ria from 'It's me'. That lovely magazine she received all the way from the other part of the world looked so very appealing, I just had to take a look here and... GREAT blog! I became a follower! Those chairs are beautiful, aren't they? 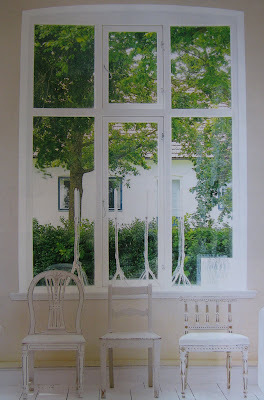 I love white interiors as well, if truth be told I'm crazy about them. 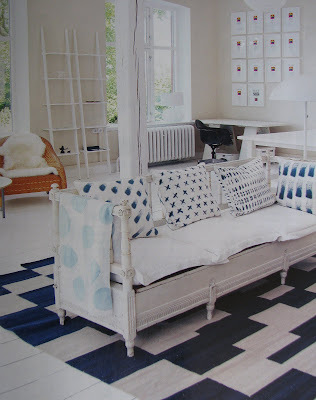 I also love the Gustavian couch and in particular the frames on the wall behind the couch. I would love to do something like that here at home....I seem at the moment to have really big pictures, but I think to add smaller ones in a group like this is something that won't date! Thanks for sharing and I hope you are enjoying your weekend. Will call in again soon.